Garnet Vineyards produces cool-climatePinot Noir and Chardonnay from vineyards in the acclaimed coastal regions of Monterey and the Sonoma Coast. California native Alison Crowe credits her decision to become a winemaker to growing up on the Santa Barbara coast, next door to wine country. Her farm family taught her a love of cooking and celebrating with food and wine. 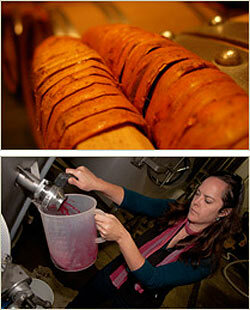 Alison proclaimed to her parents at age 17 that she would major in enology at UC Davis. 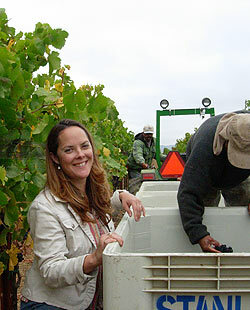 She worked her first harvest at Chalone Vineyard in Monterey County where she developed a passion for estate-grown Pinot Noir and Chardonnay. Another harvest in the Santa Ynez Valley and a year researching Cabernet Sauvignon viticulture taught her that great wines begin in great vineyards. 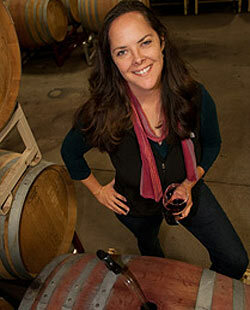 After graduating with a double major in winemaking and Spanish, Alison specialized in making estate Pinot Noir at Byington Winery and Vineyards in the Santa Cruz Mountains, then spent almost five years at Bonny Doon Vineyard making wine with Randall Graham. Alison and Chris Purdy, her husband and professional photographer, then traveled south to Argentina's Mendoza region, where she worked at Bodegas Salentein with Laureano Gomez and renowned consultant Michel Rolland. Together they created wines reflective of the rocky soil and unique high-altitude Andean vineyards. For the past seven years, Alison has crafted wines from Carneros, Monterey, Napa Valley, Russian River, Sonoma Coast and Santa Barbara County appellations. "We make wines literally from the ground up," she says, referencing the long-term relationships she has developed with the vineyards. "I believe in respecting the fruit and letting the vineyards speak their particular truths. Sometimes all I have to do is get out of the way." A frequent contributor to Wine Business Monthly magazine, Alison also pens the popular "Wine Wizard" column in WineMaker Magazine, and is the author of The WineMaker's Answer Book. Most recently, her blog, GirlandtheGrape.com, won "Best New Wine Blog" in the 2014 Wine Blog Awards. She lives in a vintage 1898 house in Napa with her husband and two small sons where they enjoy gardening, cooking for friends and participating in Napa's vibrant downtown scene.